I like to eat Australian food like a piglet, and so I go to Tuck Shop quite a lot. Because the menu serves a list of constant cravings-- sausage rolls/ meat pies, brussels sprouts, scalloped potatoes and "Tim-Tam Slams" are pretty much my idea of comfort food heaven-- I started chatting with the sometime counter guy, who I even recognized at an art fair in the Hamptons this summer! 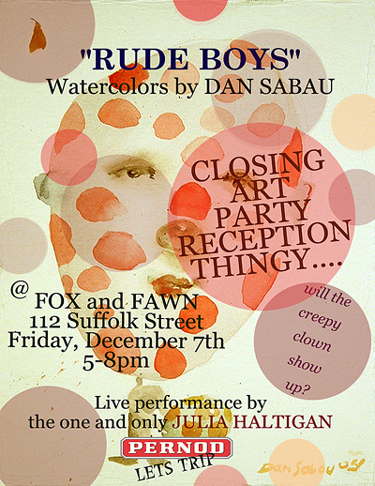 It turns out his name is Dan Sabau and he is a painter and a talented one at that. Above, his painting Djuna As Alien (oil on canvas, 60 x 48 inches). J'adore Snarrl, too. Noted, from his artist statement: "My paintings explore the mental and physical aspects of human emotion by pushing the boundaries of conventional portraiture... They celebrate our fascination with the beauty of tragedy." You can view his work online as part of his "Another Girl/Another Planet" series, and also at Feral, and at his personal site, and I certainly suggest that you do! It's exquisite.